The plug-in animation effect is defined in the Animator as part of a costume for a ModelActor. The effect provides the capability to reposition the vertices in the model. It is requred in the Animator and in the Renderer modules. In the Animator it is required to provide a function to set the parameters that relate to the effect, and a second function to provide a preview of the effect in the Preview window. In the Renderer it must provide a function that generates the same vertex coordinate movements. Note: The animator uses both integer and DOUBLE data types to represent the vertex coordinates, the Renderer uses both integer and FLOAT data types. In the renderer the DOUBLE data type is reassigned to FLOAT to save on memory usage. Plug-in effects (and shaders/image processors) all have user configurable parameters. The number and type of the configurable parameters necessarily support different numbers of and different types of data. To be able to store these in the .MFX and .OFX files OpenFX stores these parameters as a text string - each effect plug-in is expected to begin by reading its parameters from the parameter text string (if it exists, or create it from defaults, if it does not exist.) In that part of the plug-in used by the Designer or Animator, before it terminates it is expected to write into the text string its parameters. This can normally be done using the C functions sscanf() and sprintf(). By adopting this strategy OpenFX imposes no constraints on the type or number of parameters. Each animation effect is built as a Windows DLL, it will have one or more C or C++ language source file, one or more project specific header files, a Visual Studio project file, a resource file (.RC) and a file with filename extension .EFX. The project will build to a .DLL of the same name as the EFX file. The build files can have any location, but the EFX and DLL files must be placed in the "EFFECTS" folder. The plugin source files need to include one esential header file. the "pstruct.h" header is located in the "effects" folder and it included a number of other header files defining structures used by both the Animator and the Renderer. Two of the headers define the memory allocation functions used by the current OpenFX, these are located in the "animate" folder. The "common\mem.h" file provides system speciifc memory allocation function defines. The animation structures open to the effects to use are presented in header "sfxinfo.h" (Located in the effects folder) and the rendere structures that will be requried in an animation effect are defined in folder "render2", file ..\render2\vertex_face.h"
The resource file (.RC) will contain a dialog box description to allow the effect's parameters to be set by the user. To get a feel for a plugin animation effect we shall look at a plugin for a simple wave effect that deforms the vertices of the object it is applied two in a wave like manner. these are located in the "effects" folder. The build project file is also located in the "effects" folder and there is a SLN file that includes all the effects projects. The build process will create a DLL file called wave.dll in the effects folder. 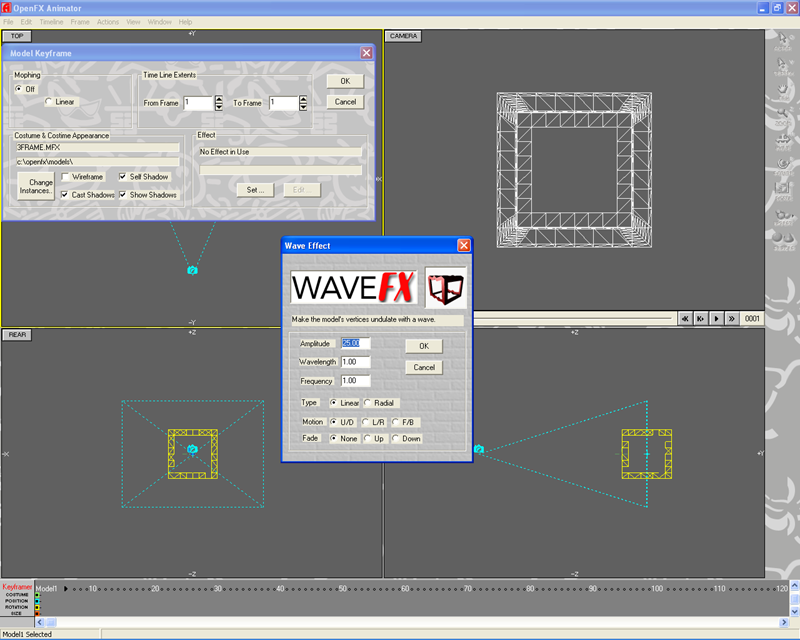 The wave.efx is a dummy file containing nothing, it is used for the external texture selection box to provide a list of all effects, it can be regarded as a simple place holder. If you want to start writing a new effect plugin then we suggest you copy the files from the example plugin to a new set. It's possible to copy the .VCPROJ files and modify it using notepad replacing all instances of the string "wave" with the name of your new texture. The plugin code follows the basic design of a Windows DLL . In this section we will examine the parts of the source file that are common to all effects plugins. The most important items to be aware of are the names of the functions called by OpenFX's modules. These functions use pointers to data structures through which access to the OpenFX main module's (designer/animator/renderer) memory management, and other functions may be made. The second argument is a handle to the container's window. This handle is used in the generation of the modeless dialog box that allow the user to enter the effect's parameters. Accessing variables and functions in a DLL module through direct use of a pointer to the X__MEMORY_MANAGER is very tiresome. For example to use the Designer's number of selected vertices variable (called "NvertSelect") it would be necessary to use the code ( (*(lpevi->NvertSelect)) ) to gain access to this variable. This is very messy! To overcome this issue and provide an interface to the Reindeer's functions that make them look (in the code) just like normal function calls, a number of #defines are included in the header file "defines.h" , which is one of the ".h" files that every plugin must include. Animation effects need to provide functions that show the action of the effect in the Animator and render the effect in the Renderer. There is an additional complication in the case of animation effects: Local or Global action. With a global action, the effect should apply its effect in a global (or world) frame of reference. Thus in the example, if the effect is supposed to apply in the vertical Z direction, but the model is rotated so that its local Z axis is horiziontal and Y axis is now vertical, then an effect that is to apply in a vertical direction will change the model's Y coordinate. To allow the effect to access the animator's internal variables two data structures are defined in the "sfxinfo.h" header. An instance of these structures is populated by the Animator and pointer sto thes are passed to the effect. strcpy(Op,buffer);  // copy parameter string from local buffer to the new string. Exported functions called by Renderer to generate the effect on the object in the scene. // Renderer function to implement the effect if it is global. Exported functions called by Animator to generate the effect in the camera view window. This will essentially be the same as the Renderer's functions. To return to the wave example, we can look at how the effect is generated. The wave effect is a local effect so only the local effect functions are used. With the exception of the format of the vertex data passed to the effect, the preview (used by the animator) and the final rendering (the effect is called by the Renderer) are exactly the same. This completes our discussion of the "Wave" plug-in efffect as part of the material.